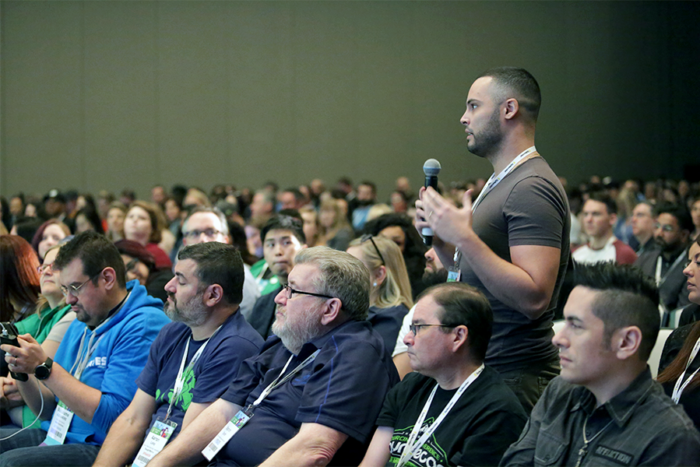 I was recently fortunate enough to attend my first-ever work conference, SourceCon in Seattle! But there was one catch: I went by myself. Not going to lie, the thought of joining a large group of overly friendly people who make a living out of networking was more than a little daunting. As an introvert, here are some of my key takeaways and pieces of advice for how to navigate a large convention by yourself. Participate in the conference app! You don’t have to follow every thread on the community chat and keep up with all 300+ (and counting) notifications, but at very least pick a few and contribute something. Get your name out there and break the ice early! Look at the attendee list and ID some people to meet. Connect with them on LinkedIn, or send them a note through the app. Cultivate some familiar faces. Use the app to plan your agenda, but don’t feel locked into it– it’s okay to change your mind at the last minute regarding what track talk you want to be at. Check your preconceived notions at the door– There are recruiters/sourcers of all walks of life that attend. EVERYONE has something to contribute. Be open to the messaging. Go to the pre-con social activities (located on the app’s messaging board)– Grab breakfast with a group, or meet people in the lobby. These will be your first, and in my case, best friends of the con. This is a good way of starting small and working up to the massive crowd of people. On making friends: Once you meet someone, from then on they are a friendly face who you can feel free to walk up and say hello. No really, talk to the Welcome Wagon people. Dive in and don’t look back– This is a social atmosphere where networking is EXPECTED, don’t let the fear of sounding like a sycophant hold you back from making connections. Vendors are people too– be polite and listen to their spiel (you may learn something!). If you forgive the expression, they become “real people” after giving you the sales speech and demo. Remember, once you’ve met someone you become convention friends. Vendors are no exception. Don’t be afraid of shoving your business card into people’s hands or asking to take a picture of their badge to remember them later. As this was my first-ever work convention, I felt an absolute joy and novelty at finally having a chance to give my business card to people. The best advice I received was to record the sessions on your phone to listen to again later. I still actively took notes, but it helped to relieve the fear of missing something. This admittedly is where I failed socially. As a first-time SourceCon-goer, and a never-done-this-before Hackatoner I was a little out of my depth and didn’t know what to expect going in. I left feeling like there were two ways to enjoy a Hackathon– by yourself focusing on learning or with your con friends in a large social group (likely the superior choice). Regardless, participate. You get what you put into the experience.